Dr Dormon, B.Sc., M.A., D.C.
Born in Scarborough Ontario, parents lived in Brooklin Ontario at the time. Grew up and went to public school and high school in Oshawa attending O’Neill Collegiate and Vocational Institute. Attended the Canadian Memorial Chiropractic College, in Toronto. Graduated with honours in 1984. Continued with chiropractic education in a two year full time residency, studying radiology and teaching radiology to Chiropractic students. 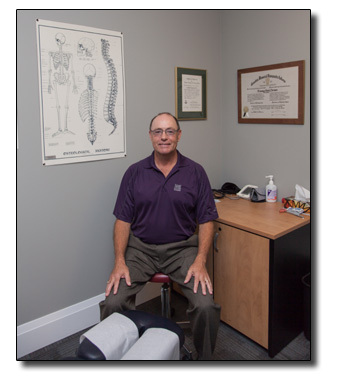 Began a chiropractic practice in north Oshawa in 1987. Has been practicing chiropractic in north Oshawa ever since. Other endeavors have included attending Trent University and completing a Master’s Degree in Anthropology in 2007. The study of the biology of the skeleton and paleopathology of joint disease culminated in a Thesis discussing degenerative joint disease in an ancient Maya population from Belize. Dr. Dormon has three children who have all gone on to higher education having graduated from high school in Oshawa. He is married to Rosemarie who is also the office manager and receptionist at the clinic. Dr. Dormon’s interests include outdoor activities on or near water, skiing, socializing and reading.